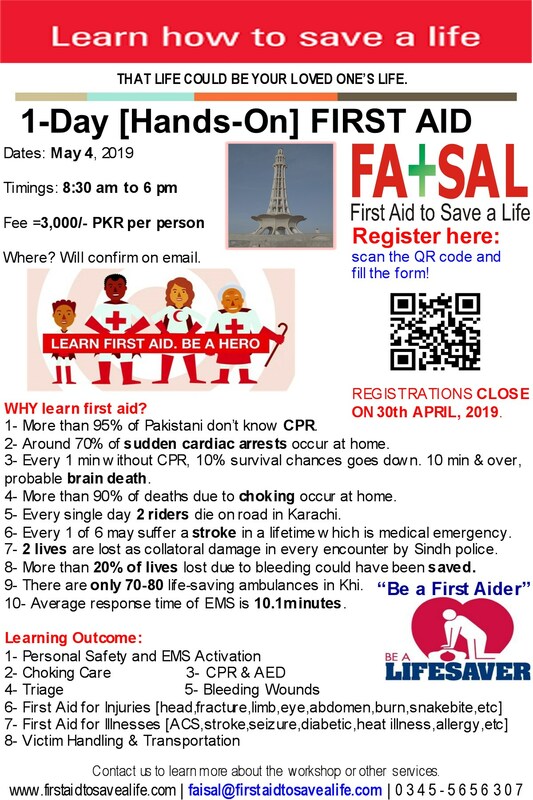 Our First Aid READY program will tailor one for you to help reduce losses and offer immediate first aid to save lives. We experienced that majority of the workplaces in Pakistan are NOT First Aid READY. To help you workplace minimize their risks we learned and evolved the service First Aid Ready program. When did your workplace last undertake a First Aid Assessment? Is your organisation a high or low risk workplace? Do you have workplaces that are remote or where access to emergency services is limited? When your First Aiders are away from the workplace – sick, at lunch or on leave, how do you currently cover them? Do all First Aiders in your workplace have current First Aid qualifications and up-to-date skills obtained in the last 12 months? Does everyone know who the First Aiders are in your workplace? Does your workplace have visible First Aid Kits and Signage? How often is your First Aid Equipment checked so it is ready for a First Aid emergency? Does your workplace require a First Aid Room and/or Equipment? Does your workplace run First Aid Drills? Do you need assistance to assess your First Aid Drills and Procedures? Are your workplace First Aid Procedures visible and accessible? Would you know if, and when, your business requires additional First Aid? Do some of your activities increase First Aid risk to employees, visitors and customers? How do you cover First Aid beyond standard business hours?